Mrs. Patricia Van Buskirk teaches first grade at Divine Wisdom Catholic Academy. Mrs. Van Buskirk is a graduate of the St. John’s University School of Education. She also holds a Master’s degree in Reading from St. John’s. Mrs. Van Busirk’s career encompasses over eighteen years of teaching experience. 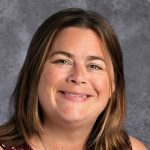 In that time she has had the privilege of teaching at a variety of grade levels, including first grade, nursery, fourth grade, fifth grade and resource room. Mrs. Van Buskirk has recently been accepted into Fordham University, where she is currently taking classes to earn her Master’s degree in Building Leadership. Mrs. Van Buskirk believes that students will be successful when they are exposed to a variety of learning methods. In the summer of 2010 she attended the Columbia University Teachers College Reading Workshop. Mrs. Van Buskirk has implemented many of their methods such as a leveled library system and steering students toward their “just-right” book. She is also an avid user of the SMART board technology which is available in every classroom at DWCA. Mrs. Van Buskirk is looking forward to working with another group of wonderful students this school year.